Hello! This week's fashion topic is a continuation of last week's post 'Holiday Wear, Fantasy Style' where I talked about what I would wear if I had a fancy holiday party to attend. But because I'm a Wisconsin girl that doesn't have affluent friends who throw elaborate parties, and I live in a cold climate, this is what I really wore to my Christmas church service ( I was too sick on Christmas day to wear anything but leggings and a sweatshirt). I normally like to wear something red with a little sparkle for the holidays, but this year I chose to go with an all winter white ensemble. I still stayed with my tradition, and kept the sparkle though! Now your probably wondering for a Wisconsin girl where is all the snow. We didn't have any snow for Christmas this year! Don't worry though…Mother Nature was kind enough to drop about six inches the day after Christmas (insert a gag here). I bought my sweater from Sears. Now, I usually don't shop at Sears, but I really wanted a sweater with this style. Some people call it a Waterfall Cardigan, others use the term Flyaway, whatever it is, it is very popular and I couldn't find one anywhere. I finally decided to check Sears because I thought "No one shops there, they must have some left in stock!" and they did! So I bought two, this one and a purple one. 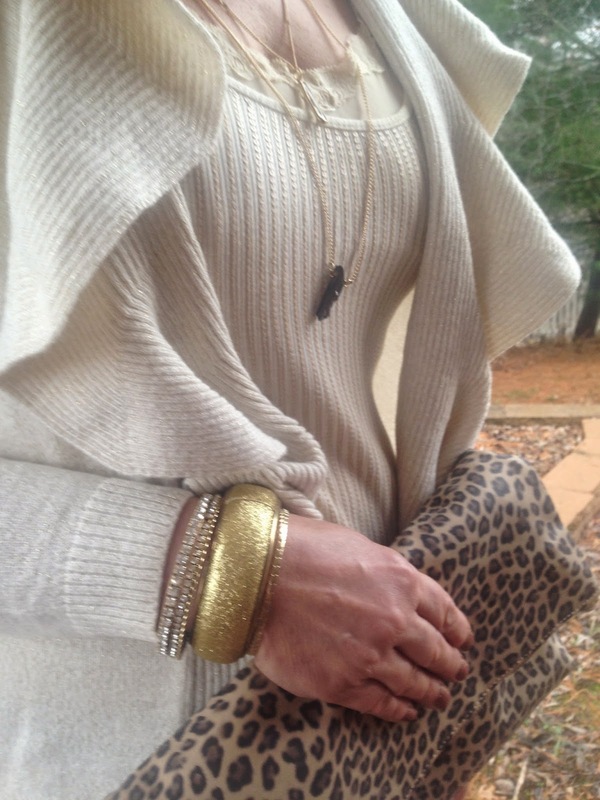 This sweater has a gold metallic thread woven throughout, which is perfect for the holiday season. 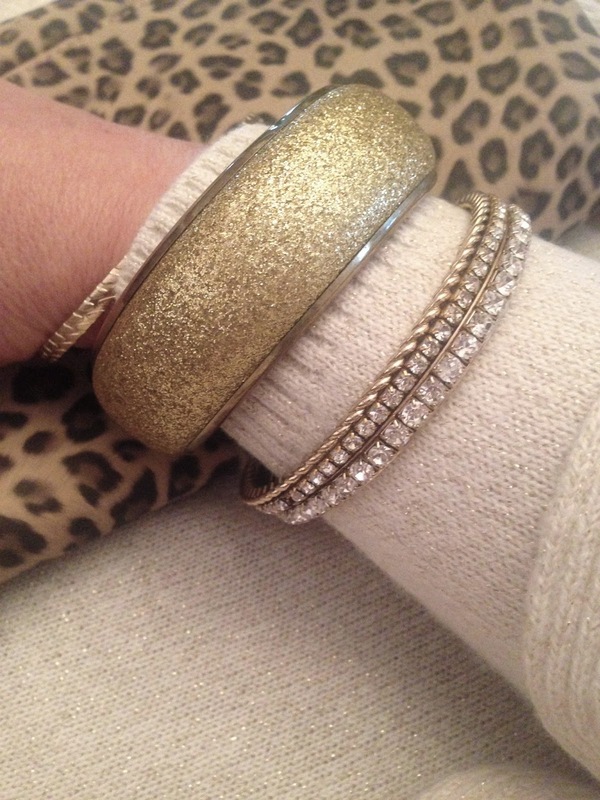 I added even more sparkle by wearing a gold and off-white sequin tank top underneath the sweater and some gold and diamond bangles on my wrist. My necklace had three strands of gold each with it's own unique stone. I bought it from Express. One of the benefits of not working anymore is that I finally have time to paint my nails! In my old job, my hands and nails were constantly beat up from hard work, so painting them was futile! But now that I'm a 'lady of leisure', I can have pretty hands again! 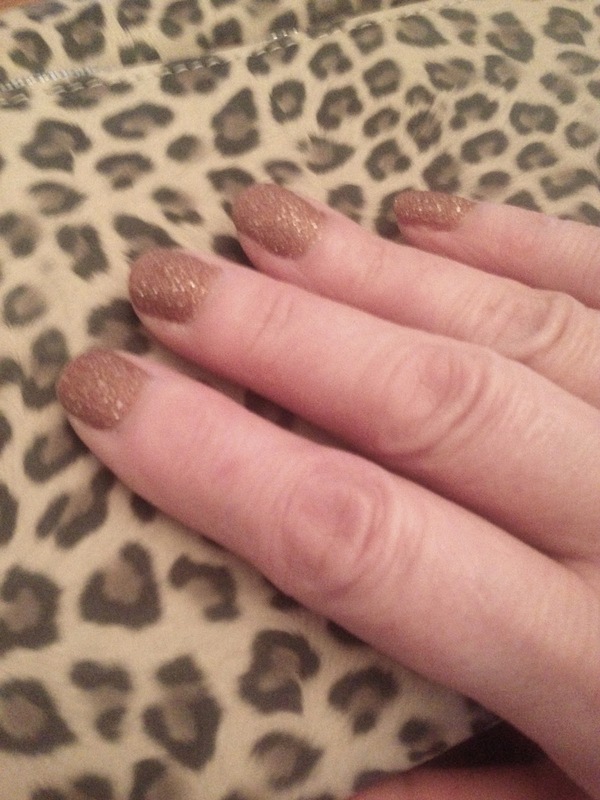 I decided to try one of the new glitter nail polishes for Christmas. My camera had a time focusing with all the busy prints, but you can still see the glitter in the picture below. I love the look, but the polish does feel rough to the touch and it takes awhile to get use to it on your hands. It is also very difficult to get off too. 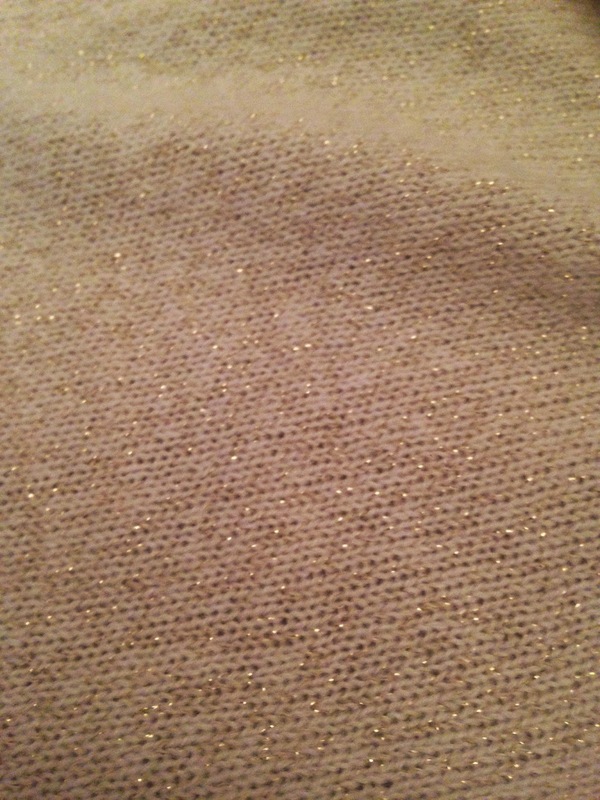 Here is a close up of the sweater so that you can the metallic thread woven throughout. It is so pretty, and perfect for the holidays or any special winter evening. 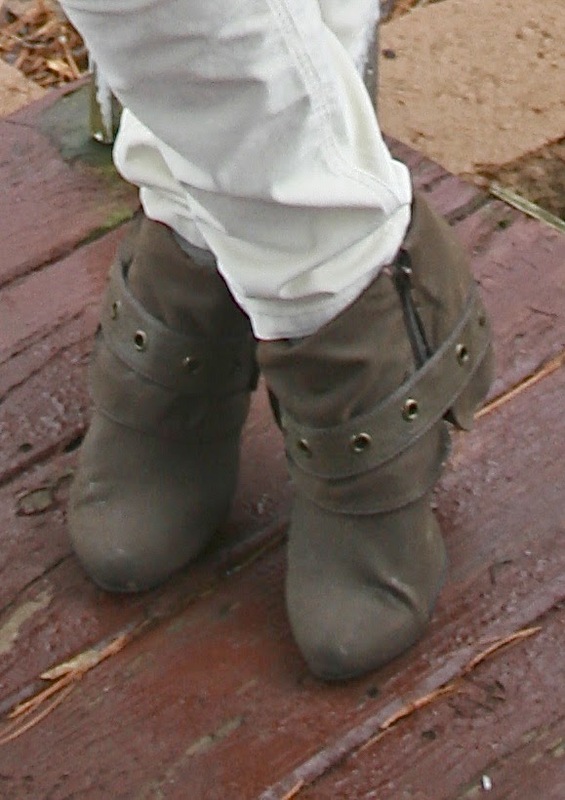 My off-white corduroy pants are from J.C.Penney and my taupe booties are old, and are from Famous Footwear. My son thought I was crazy to wear all white from head to toe, so I heeded his advice and broke it up a bit by carrying a leopard print clutch and adding a brown belt and shoes. So that's it! This is what Wisconsin girls usually wear for the holidays. We'd love to wear the skimpy, strapless, sparkly dresses we see all over store ads and fashion magazines, but that's just not possible in our climate. It was below zero for us on New Years Eve! Bare legs, no sleeves, and high heels for the holidays are for Miami girls, not Wisconsin girls. So we compensate by wearing holiday colors, Christmas sweaters, and anything with a little sparkle. It doesn't matter, as long as it's WARM! What about you? What did you wear this Christmas and New Years? I'd love to hear from you! You look Great Amy as usual! Happy New Year and please keep sending your lovely outfits. I also really love the background of your photos. Haha!! I loved your reasoning for shopping at Sears. "No one shops there, maybe they will have one." TOO FUNNY. Your outfit and nails both turned out great and I hear you on not having fancy holiday parties to attend! I miss them but at the same time, I always felt like the outfit was a waste of money because it's a lot of $$ for an outfit I'll probably only wear once! Beautiful outfits, they all look fabulous! Be sure to join the Trendy Wednesday Blog Link Up, every Wednesday! This look is niiiiiiiice, love it very much ! Happy New year my friend, all the best for your and your sweet family ! Haha- you seriously cracked me up about Sears! I love how this all came together, Amy! The sparkle and shine really made this a stand out. The little pop of leopard your son suggested really worked.